world there are no prisoners, and no concept of Mercy..."
It is the Year of Settlement 736 and from the northern wastes of the world a great Army arises to plunder and destroy the lands of Men. Against this threat stands the Grand Army of the Four Nations, their fate resting on the strength of their spirit and the keen edges of their swords. In this world Men have nowhere left to go. 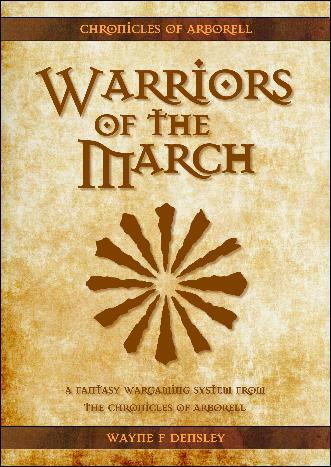 Warriors of the March is a large-scale wargaming rule-set that allows readers of the Chronicles of Arborell gamebook series the opportunity to recreate the great battles of the Horde Wars of Arborell. This is a wargaming system that uses a Commanders Guide and a series of downloadable tile sets to create the Armies of the Four Nations and the forces of their greatest nemesis, the Oera'dim of the Sigh. Long has been the antagonism between these two ancient cultures and great has been the devastation wrought by their conflicts. In Arborell there are no prisoners and no concept of mercy. This game system is for two or more players and allows engagements to be fought in a range of different modes. Within the Commanders Guide can be found all the rules required to play Standard Games, historical information and battle details to recreate the major battles of the Sixth Horde War, as well as non-campaign scenarios covering a wide range of combat types that can be applied with this rule set. Complete historical battle information for three important battles from the Sixth Horde War of YS 736, the Assault on Truvo Farm, The Battle for Drenim Ford and The Battle of Traebor Meres. A Quick Reference Card that can be printed and used as a handing reference for Attack and Defence Tables and Unit Special Notations. 2 Movement length rulers for measuring distance. Warriors of the March is provided as an internet download and as such does require some setting up prior to play. The Commanders Guide can be used as a screen-based guide or can be printed and placed into an appropriate folder. The Basic Tile Set does require printing and then each of the tiles to be cut and separated into the two army decks that make up the Armies of the Oera'dim and the Grand Army of the Four Nations. Also supplied with the Basic Tile Set is a set of Skull tokens and two movement rules to measure distance within the game. This initial wargaming set is only the beginning of a much larger series of wargaming scenarios that will include a full Campaign Manual for the Sixth Horde War plus additional tile sets and manuals for the War of Tree and Leaf, The War of Three Nations and the Great Insurrection of the Oera'dim.